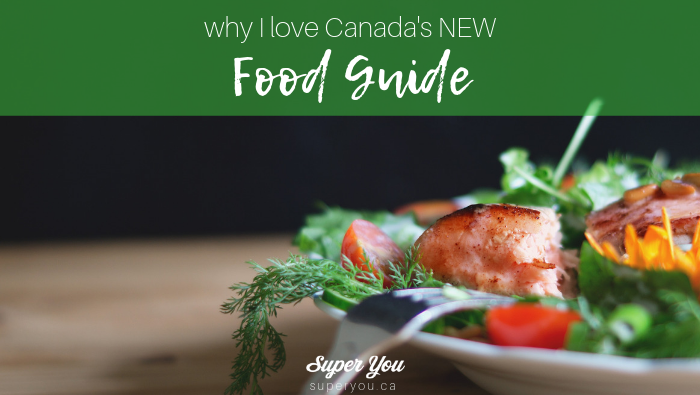 Health Canada recently released their long awaited update to the Food Guide and I could not be more excited. Not only have they done away with confusing portions and servings (that no one can remember anyway), they’ve incorporated some of the very important factors around nutrition health habits that I think are essential to a healthy relationship with food. Here are the highlights including why I think they’re so powerful. The guiding principle for the food choices is: eat a variety of healthy foods each day. This guidance is paired with this powerful image (see left). You’ll notice that the diary requirement is gone (though it can be incorporated in protein foods (ex. yogurt). I think this is a good move since so many people are not tolerant of dairy and the way this is now structured really encourages people to choose what will work for their bodies! I also love that it’s (generally) moved away from saying what foods you “should” and “shouldn’t” eat in each category. The image simply shows a variety of fruits and veggies, proteins and whole grains. And it’s up to you to decide what works for you! Yes to customization and individualization! I also love that the guide has moved away from portions and servings. Which were frankly confusing for most people and not functional. This “plate” suggestion, offers a simple visual that people can use to guide their choices. 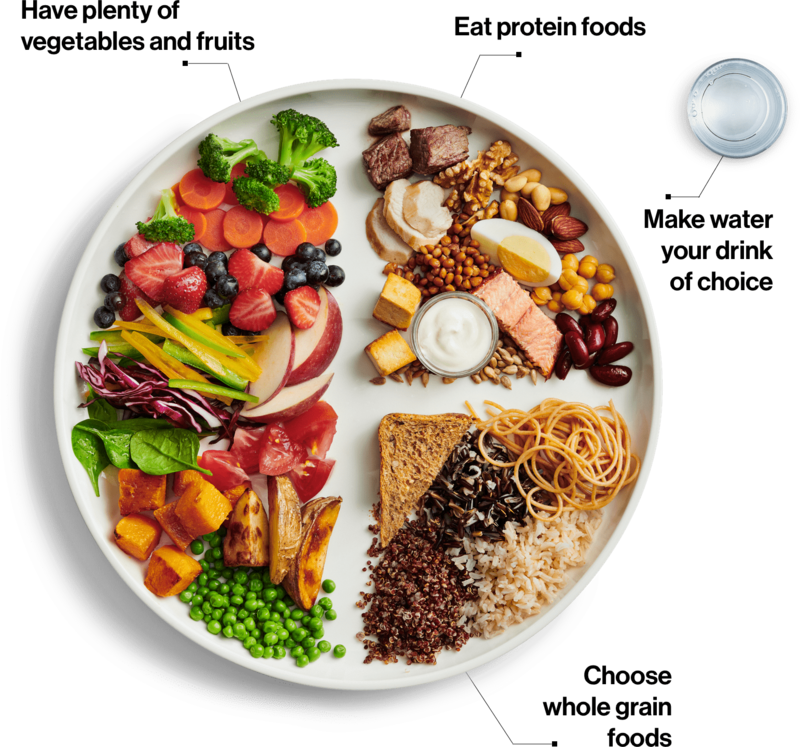 Even if you use a fairly large plate, but fill it with mostly veggies and fruits, proteins and whole grains – that’s a wonderful approach to nutrition! In fact in a study of over 100,000 men and women they found that those who focused on quality of ingredients had far more impact on overall health than quantity. That if you focus on quality of foods first, the quantity in essence sorts itself out. This is one of the many studies that was consulted in the process of the development of this new guide. It encourages mindfulness. I truly believe that mindfulness. The simple act of noticing how we feel both physiologically and emotionally is huge, especially when it comes to how we choose to nourish our bodies. 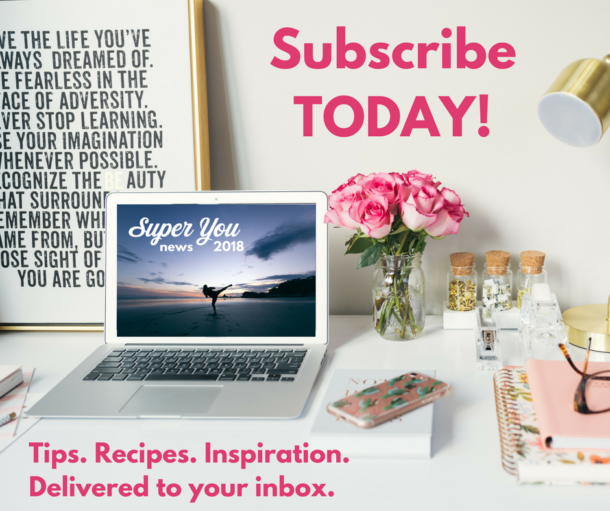 The practice of mindful eating has been a truly game changing for me (which is why I include a whole lesson on it in the Super You Studio!). Cook more often. Yes to the yes to the YES! I get it, life is busy. But sometimes I think we vastly overcomplicate home-cooking. We’ve gotten used to finer cuisine – which I love – but I think sometimes it ends up stalling us because we’re underwhelmed by our home cooking or we don’t know where to start! Start with simple. Check out some of my simple recipes that are totally healthy (and most of them on the table in 30-45 minutes MAX!). Instead of getting black and white and trying to “clean slate” and cook all your meals at home, lean in with 1-2 more meals per week at home until you’re eating at home the number of meals that feels right for you! Enjoy your food. Can I get a hallelujah?! Food is part of the fabric of our culture. Whether it’s cake for birthdays, ice cream on a hot day or latkes for Hannukah. Food is more than fuel. And food is also fuel. So, whether you’re indulging in a treat for a celebration or for fun (nourishing your soul), savour it! Truly be present and enjoy the whole experience. Speaking of which – eat meals with others. So important. Not just for us adults who are honestly mostly starved for genuine interaction – but especially for kids. One of the greatest ways we teach our kids to have a healthy relationship with food is through role modelling. So if you’re constantly dieting or making less healthy choices – that’s what they’ll do too. I don’t say this to be shamey, but to be honest. We are our children’s greatest teachers. Treat food the way you want them to treat food! Review the ingredients list – Can you read and recognize all the ingredients? Do you feel good about what is listed? Is it short or long (generally short lists are less process, but not always). Check the sodium – aim to keep the % DV under 15% to keep your sodium within recommended amounts. Limit foods high in sodium, sugars or saturated fats. This is just good basic advice. Be aware of Food marketing. I think this is especially huge. Food marketing has gotten extremely savvy. Remember that the goal of all food ads is to make you want the food. They don’t have your best interests in mind. They have their best interests (to sell the product). Is this everything you need to eat healthy? Yes…and no. At the end of the day you need to decide what foods do and don’t work for you – your body, your lifestyle, your priorities and commitments. No single person on this planet has the exact same genetics – which means how we each respond to foods will be different. Layer in some of the mental/ emotional side of eating and we have some pretty big differences between us. If you’re working towards integrating the food guide, start small. Choose one element of the guide to focus on: water is a great one, as is the concept of the plate (1/2 fruit and veg, 1/4 protein, 1/4 whole grains) or mindful eating. Choose whichever one you think would benefit you most. Focus on that, and then build from there. Craft the unique approach to eating that works for you – right now! Questions about the Food Guide and how to use it? Feel free to email me. I’d love to chat about how I can support you in integrating it into your life!